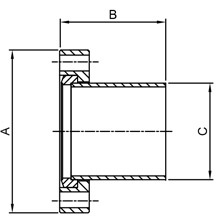 CF Tubulations Rotatable are used to weld into other fabricated parts to produce ports for instruments and feedthrough attachments. Manufactured from: 304L Stainless Steel. Helium Leak tested to 10-10 mbar. They are supplied in a plastic bag with a protective plastic cap.